From the authors of the international bestseller The Babylon Code comes an explosive exposé of the chilling truth about the fierce opposition to the Trump presidency, and why the globalist elite and Deep State will stop at nothing-assassination, military coup, staged economic collapse, or worse-to overthrow him."Trumpocalypse!" It's the media-coined meme inciting panic and fear that America has elected an unstable man who will barge into delicate international affairs like a bull in a china shop and incite nations bent on America's destruction to trigger World War III-an unprecedented nuclear apocalypse ending the world as we know it. 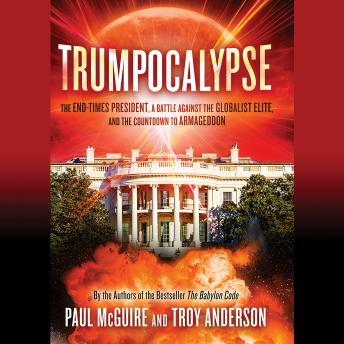 But is the media telling us the truth?No, say internationally-recognized prophecy expert and Fox News and History Channel commentator Paul McGuire and Pulitzer Prize-nominated investigative journalist Troy Anderson. America's most insidious enemies are not hostile nations; they are elite globalists-the "Establishment" that is making the "1 percent" even richer while working- and middle-class people watch their incomes and net worth's flatline or plummet. The authors fearlessly expose the globalist elite's secret plan for humanity and campaign of mass deception. Using documentation gleaned from years of journalistic investigation and extensive interviews with over fifty of the world's most respected geopolitical, economic and military affairs experts, faith leaders, and biblical scholars, McGuire and Anderson unmask these elites as members of secret societies with deep occult connections who have gained control of America's dominant institutions-government, education, entertainment, international banking, and even the media.Trumpocalypse explores the enigmatic prophecies and "biblical codes" involving Trump, and asks whether God raised up President Trump as a fearless leader to guide America and the free world through a series of major crises as the biblical end-time narrative unfolds, as many people with prophetic gifts are predicting, and shows why everyday Americans and evangelicals have rallied around Trump as their last hope of saving America and averting the horrors of the Apocalypse. It further reveals why Trump and millions of "deplorables" are fighting to stop the hidden agenda of the Establishment, and how the perplexing chaos enveloping the planet could paradoxically signal the beginning of the great end-times awakening that millions are praying for.Here is an invitation to join the anti-Establishment surge-what evangelist Franklin Graham calls "the Christian revolution"-and discover how to fulfill your own destiny in the run-up to the Second Coming of Jesus Christ.